For Poland in the August of 1939 war was imminent. The 10 year old Julian Kulski had been taken by his father from Warsaw to the town of Kazimierz on the river Vistula. The hope was that Julian and his family would be safer there than in Warsaw. 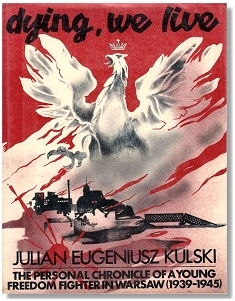 Julian's father was almost immediately summoned back to Warsaw by the Mayor Stefan Starzynski to prepare for the coming invasion. On 1 September Nazi Germany attacked Poland and World War 2 had begun. By mid September the Germans had occupied Kazimierz and raised the German flag. At the end of the month the capital city of Warsaw surrendered. Julian Kulski and his family returned to Warsaw to find that their home in the Zoliborz district had lost half of its roof to a bomb. On 5 October Adolf Hitler took the salute from a victory parade of German soldiers on Ujazdowskie Avenue. At the end of October the Gestapo arrested Mayor Stefan Starzynski. Julian's father now became the Lord Mayor of Warsaw. He was arrested by the Gestapo in November and held as a hostage along with other leaders. The Germans had anticipated Polish protests; there were none so the hostages were released. On 1 September 1940 a year after the invasion Pilsudski Square was renamed by the Germans Adolf Hitler Platz in order to celebrate their victory. In October the Germans announced that the city was to be divided into three separate housing areas: German, Polish and Jewish. People had one month to move to the right area. The Germans built a brick wall to enclose the Jewish Ghetto. In January 1941 Julian learned that his Uncle Norbert and 500 other prisoners had been taken from Pawiak Prison and transported by cattle truck to the concentration camp at Auschwitz. He died later that year in the camp. The Germans attacked their former ally the Soviet Union in June 1941. The following month Julian's pre-war Scout instructor asked him if would like to join the Union for Armed Resistance (ZWZ). He immediately said yes and was sworn into the Polish Underground. The main task of most of the Underground was to prepare themselves for an Uprising against the Germans. Each member of the Underground had a pseudonym so that if they were caught by the Gestapo and tortured they could not reveal the real names of their fellow members. In February 1942 the ZWZ was renamed the Home Army (AK). In June 1943 Julian was arrested by the Gestapo and taken to their headquarters in Szucha Avenue. He was interrogated and asked to reveal what company he belonged to in the Underground Army. Two weeks after his arrest and much to his surprise he was released by the Gestapo. An SS General told Julian, and his father, that he did not believe he was innocent but because of his age he was being released this time. On 3 May 1944, Poland's national holiday, Julian attended the May Mass in honour of the Virgin Mary at Saint Stanislaw Kostka Church in Zoliborz. He went up to the top gallery and stood next to the organ loft. Towards the end of the service he knocked on the door and entered the organ loft. He asked the organist to play the hymn God Who Hath Saved Poland, the Polish national hymn since the Uprising of 1830. The organist was reluctant to play it fearing that he and the priest would be executed by the Germans for doing so. However, the organist relented and the chords of the national hymn rang out. Deliver us from our dire shadows. Julian immediately left the church and the rest of the congregation quickly dispersed for fear of German reprisals. By July 1944 they had finished their training and were put on active alert. On 1 August 1944 an armed uprising against the Germans in Warsaw began. Julian's platoon was given the order on 5 August to defend the Fire Brigade Building, Slowacki Street, in Zoliborz. The building was heavily shelled by the Germans but they did not return fire. The Germans thinking that the building was empty attacked a barricade 275 meters beyond it. When Julian's platoon received the order to fire they took the Germans by surprise and inflicted many casualties upon them. The Germans pounded their building with shell after shell. After 10 days Julian's company was relieved and removed from the front line. On 22 August they were ordered to take part in an attack against the Warsaw - Gdansk railway station which lay between the Underground held areas of Zoliborz and the Old City. They suffered heavy losses. By 27 August the Old City was a pile of rubble. The Home Army (AK) command decided it was no longer possible to hold it. The Underground forces escaped from the Old City to the city center via the sewers on 2 September. The Germans captured the Old City on the following day. At the end of September the Home Army (AK) surrendered to the Germans. Julian's company was disarmed and taken into captivity. The Germans put Julian and other Home Army soldiers onto a train of cattle trucks and sent them to a prison camp in Germany. On the 3 May 1945 American Red Cross trucks arrived at the camp to take away American, British, Belgian and Dutch prisoners of war. Julian managed to escape from the camp in a truck of American soldiers. The alternative was to wait at the camp for liberation by the Soviet Red Army. Julian arrived in England one week later. Publisher - Published in 1979 by Holt, Rinehart and Winston, New York, USA. This page was added on 28 May 2011. Updated on 08 May 2013.